PBS (Channel 13 in New York) has a new series called “Savage Planet”, with this home page. On Monday, June 22, WETA aired “Deadly Skies” (episode 3). The program focused on two major threats: cloud-to-ground lightning and hail in supercell thunderstorms, with a couple of storms in Sydney Australia (moving East to West) as examples, and meteor showers, particularly pieces of asteroids. It did not deal with tornadoes. The program took the position that we map only a small fraction of the asteroids that could hit us. Once every few hundred thousand years, we take a hit (from a body over 1 km or so in diameter) that could wipe out civilization. The show also takes the position that comets are even more dangerous than asteroids. 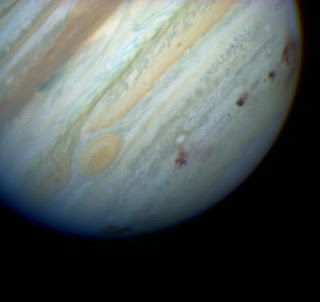 The last part of the show summarized the Shoemaker-Levy comet that hit Jupiter in 1994 (link). We wouldn’t be here if it weren’t for Jupiter, which protects Earth from most of the fragments that could hit it. Attribution link for Wikimedia Commons NASA picture of the impact of Shoemaker-Levy on Jupiter, here. "Impact": What if a piece of a brown dwarf hit the Moon (or the Earth, for that matter)? On Sunday, June 21, 2009, ABC aired the first two hours of its miniseries “Impact”, directed by Mike Rohl, written by Michael Vickerman, apparently financed and made in Germany and Canada. The second half airs June 28. The movie opens with a meteor shower, with the Moon taking a huge hit from a large piece, in sight of a boy’s telescope. Soon there are odd effects around the world: the little boy shocks everyone with a tape measure home run in Little League, when the field is attacked by lightning in clear air. In fact, whole objects and people levitate, and irregular tsunamis occur around the world. (This film bears no relation to Dreamworks’s “Deep Impact” in 1998). Astronomers notice that the Moon’s orbit is becoming elliptical, and approaching ever closer. Soon geologists recover a meteor fragment and find that it consists of the degenerate matter of a brown dwarf. The Moon is much too massive and has a piece of brown dwarf lodged inside it like a bullet needing to be removed by a 19th Century doctor in a western. It comes closer and closer, picking up whole trains, and will eventually collide with Earth. The astronomers say that two brown dwarfs collided, but in fact I think that the chunks of degenerate matter would evaporate, so it sounds like this is impossible. A rogue brown dwarf could threaten a planet directly, and it probably has happened in some solar systems in our galaxy. Attribution link for a NASA public domain illustration of a T-dwarf. It actually would look magenta if close enough to be seen. ABC aired the second half (two hours) of the film tonight. They come up with a plan to split the Moon in two and eject the fragment of brown dwarf. And, yup, they have to send astronauts, and some scientist-not-so-spaceworthy, and yes, a man (with a pregnant wife, played up for sympathy) is "elected" for self-sacrifice. Well, maybe, like in Apollo 13, they can get them back, but they don't have Ron Howard directing. The special effects, including how the Moon looks from Earth when split into pieces, are interesting. 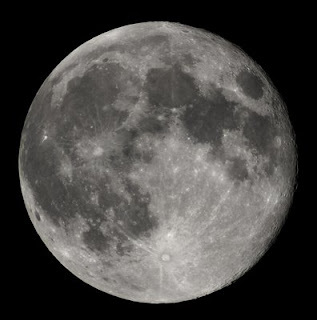 Attribution link for Wikimedia picture of Moon here. "The Seven Signs of the Apocalypse" was aired in May and June on the History Channel, explores the seven signs in the Book of Revelation. As each of seven seals is broken, a new cataclysm happens. The four horsemen of the apocalypse (link) in Revelations Chapter 6 count among the signs. The show starts to provide a number of parallels in current events to the metaphoric horsemen. The black horse deals famine – like our diversion of grain to biofuels, leading to food shortages. The red horse represents massive war, including human annihilation. The first horse is the antichrist, as in Revelations. The Pale horse represents death. There are seven disasters within seven signs within seven more signs. The “Wormwood” star could relate to an asteroid or comet. The destruction of New York and the following “Impact Winter” are simulated. The second sign deals with global pandemics, probably from bioterror, with rapidly mutating viruses that produce death so quickly that civilization breaks down. The program covers the 1918 flu epidemic and threat of H5N1 bird flu (it doesn’t mention H1N1). God will allow humans to master biology and virus creation, but man must live with the consequences. The fourth pestilence is a gamma ray burst, that could originate as far as 8000 light years away, where there is a particular star that could become the kind of supernova whose burst could reach us. The fifth apocalypse is a supervolcano, such as Yellowstone, which would start as small eruptions around the rim of the caldera, loosening it and giving us warning of impending cataclysm. Yellowstone has shown an increase in earthquakes in early 2009. The sixth catastrophe is the waters turning red, which corresponds to “red tide” cause by an algae. The show concludes with a discussion of a global battle called Armageddon. The asymmetry of modern terrorism relates to this. A nuclear apocalypse would lead to nuclear winter, similar to many of the other cataclysms. I remember when living in Texas in the 1980s hearing constant discussions in car radios of post-tribulationism v. pre-tribulationism and the occurrence of the Rapture of the Believers. Earth 2100: ABC presents the possibility of our Last Century, or can we overcome? ABC news is presenting the apocalyptic film “Earth 2100” tonight, Tuesday, June 2, 2009, on ABC Network stations. “Is this the last century of our civilization?” To prevent a bad future, you have to first imagine it. The website is here. Bob Woodruff is the host, but Van Jones also appears. The site has an annotated script for the entire program. A preview video is here. Ironically, Lucy notes that when she was born, people had already working on these sustainability problems, with solar collectors and green highrise buildings. Lucy becomes an EMT worker and moves to San Diego and marries “Josh”. She and her husband lead demonstrations against a local desalination company. But cities in Arizona lose their water. With global warming and drought, there is mass migration, especially from African to Europe, and to the United States from Latin America. In 2040, the refugees make a forced invasion, and the police shoot at the crowd. The show examines several other failed civilizations, including the Maya, the Roman Empire, and Easter Island. We have no where to go if we fail. The population reaches 9 billion by 2050, despite the claims of “demographic winter” by social conservatives in developed countries. Las Vegas (“Cibola”) had been abandoned as Lake Mead had gone dry. The couple moves to New York but has to drive across a country much of which has become lawless. For some years the live an idyllic life in “green” New York, as Josh works on the ocean barrier project. There are electric tram lines. In 2071, there is a methane release from sudden permafrost melting, which accelerates the rise of sea level. Climate change will be non-linear. Scientists tried to spread sulfur dioxide (as a “cosmic shield”) into the atmosphere and cool the earth. But there is a rebound effect, and sea levels rise quickly. A big noreaster breaks the seawall. Then there is an epidemic of the “Caspian fever”, which shuts down the entire world economy. Populations start to go down. By 2085 the power grid and Internet go out, and the US is fragmented into chards, and the Dark Ages begin. Hell becomes “truth realized too late.” People have to live off the land. Ironically, civilization collapsed even after it seemed to be getting a handle on its problems for about three decades. New York had become a great place to live, before the sudden final collapse. But the tipping point may have been passed a few decades before. The Purification. It won’t be so bad, or will it? Lucy survives to 2100, and becomes the oldest woman on Earth. The last fifteen minutes paint the alternative future, of investment, and some sacrifice for the entire country. How about electric cars that get 300 miles per charge. 200 countries meet in Copenhagen in December 2009.